The Deep Cycle Reactor is a custom plate photobioreactor that I designed for Deep Cycle (2010), an art installation by Max Goldfarb that included performances, readings, interviews and incidents by artists, writers, designers and theorists addressing the subject of a ‘post-oil’ landscape. 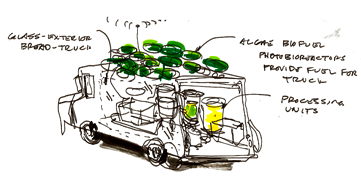 The DCR uses microalgae to purify the interior environment of the mobile communications unit M49, converting carbon dioxide to oxygen while simultaneously proposing a future source of zero-emissions algae biofuel for the vehicle. The DCR draws from key works within the field of art and ecology, such as Revival Field (1990-93), in which the artist Mel Chin collaborated with research scientists, curators, and corporations to remediate brownfield sites with specific plant species. Like Revival Field, the DCR is a functional art piece whose engagement with technology and ecology blurs traditional disciplinary boundaries.